Whenever I use Musca, I learn to reappreciate dmenu. You can keep your Unity, your Gnome3, even your gmrun or Kupfer. dmenu is a keypress and a half away and does only one teeny thing. Too bad there’s not something like that for the console. There is line completion, usually with the tab key. 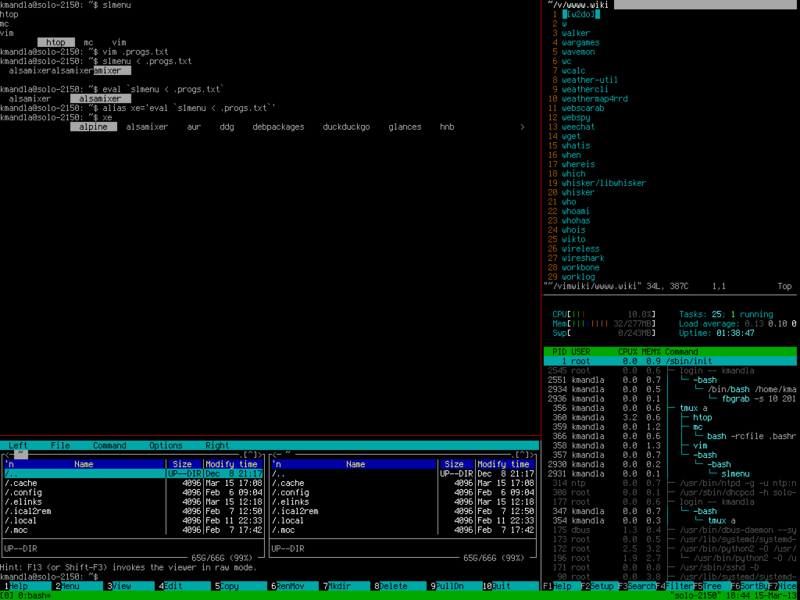 And some more advanced shells than bash do something similar to dmenu, I suppose, if you think about it. Still, one keypress and a few letters to cue up the most popular programs on your computer … that might be useful, I suppose, if you think about it. The suckless gang are rock-and-roll stars when it comes to featherweight software, so it should be no surprise that dmenu is in their stable. Imitation is the sincerest form of flattery, and the author of slmenu acknowledges that a large proportion of its code was lifted straight from dmenu. 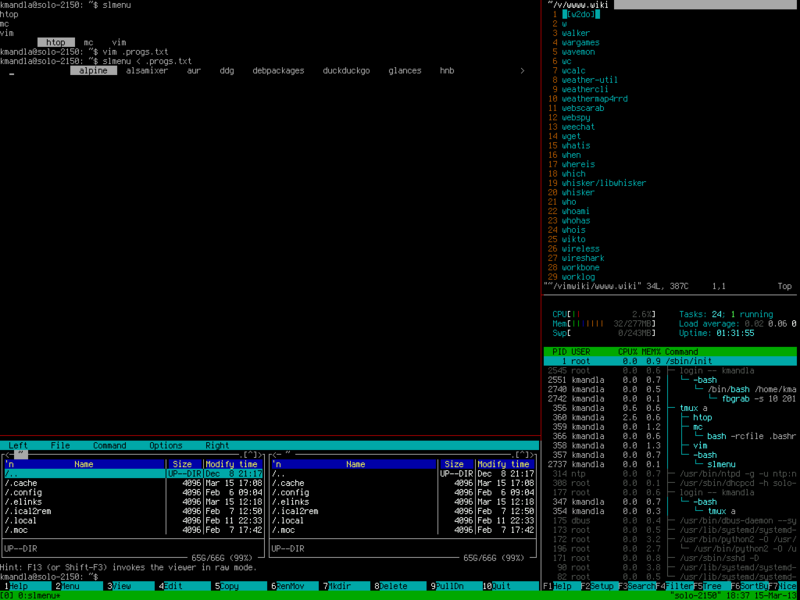 But slmenu, when prompted, looks … different? What gives? Not much to work with there, K.Mandla! What’s it waiting for? Well, I can tell you. Type in a couple of names of programs, then feed it the end-of-file key — CTRL+D. Well, yes, that’s the general idea. 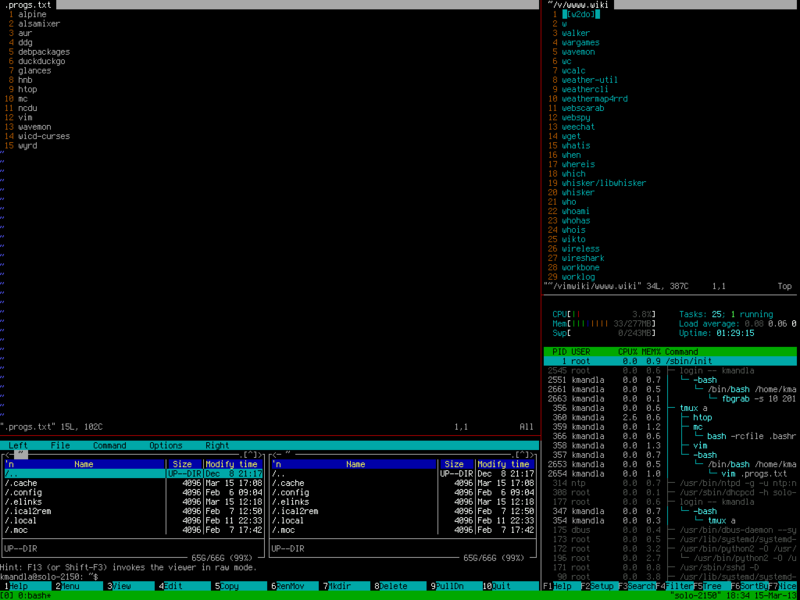 Now you have a dmenu-esque line of applications that you can sift through either with tab completion or arrow keys. But … that’s hardly helpful, you say. Who wants to type in the entire possible list of programs each time? That doesn’t just defeat the purpose, that’s the complete antithesis of what we’re chasing. Fair enough. Suppose we had a list pre-made, with the most common software on the machine, in line-by-line format. Would that do the trick? Now we just need to redirect that list back into slmenu, which is easier done than said. But now … that is a heckuva line to have to type each time, just to get a single program started. You’re much better off with the original situation, you say. Do that once and it’s good for your whole bash session. Drop it into your .bashrc and it’s there each time you log in. First we’re going to need a free key. Something that isn’t otherwise used by other software, and dedicate it to cueing that whole line, or at least the alias. Lucky me, I have an extra key on my keyboard, painted with the logo of The Evil One. The Microsoft key (or the Super_L key, or the Mod4 key, or whatever you want to call it) is tied to keycode 125 on my machine. I know this because showkey told me, when I tried it. So now I need a copy of my console keymap, which is located in /usr/share/kbd/keymaps/i386/qwerty/, but is going to depend on your machine and architecture. Choose wisely. And there it is, with the -b option to force the display line to the end of the screen. Now you’re not allowed to complain about getting that into place or needing root access to assign a command to that keypress. And yes, I know it means any time your finger grazes that key you’ll get the slmenu display. Learn not to make that mistake. This entry was posted in Linux and tagged custom, keyboard, menu, prompt on 2013/03/16 by K.Mandla. thanks for the awesome notes! by the way, you can just use the command “dumpkeys” instead of needing to go scavenge for the keymaps. also, you can make the new keymap have the customizations only for “loadkeys”. also “showkey” tells the scancode for a key. also customizing mappings is very useful for keyboards with lots of malfunctioning keys; just make other keys replace the broken ones when used with a “meta” key.